This strawberry, avocado & cashew salad is super simple, but it will make you look like a rockstar! 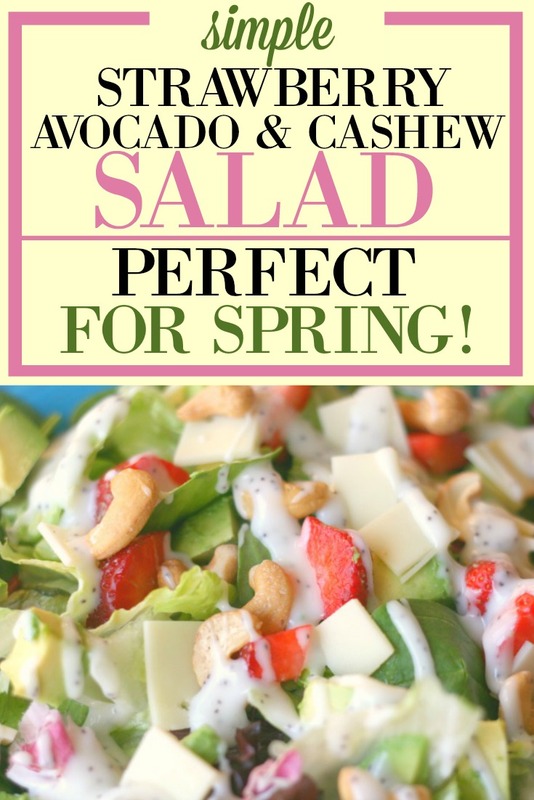 Perfect for parties, showers, Easter dinner, summer picnics, or a fresh and tasty family dinner any time of the year, this salad is beyond delicious. With all the fresh ingredients plus swiss cheese and poppyseed dressing, this won’t last long no matter where you’re serving it. Looking for some more simple recipes? Grab our downloadable favorite classic family recipes using simple ingredients you already have on hand. Enter your email below for instant access! Enter your email address to get these amazing recipes in printable form! Success! Now check your email for your recipes! Nothing says spring freshness like a salad, but adding some fruit to your salad really takes the freshness to a whole new level. There are plenty of salad recipes, and then there are little slices of heaven. This strawberry, avocado, and cashew salad recipe is just what you need to put the freshness in your spring. lettuce, the more varied the mix of lettuces, the better! Mix lettuces together. I like to use a combination of spring mix and romaine. Prepare all other ingredients except dressing. If serving within 30 minutes, mix. If it will be longer than 30 minutes before serving, keep ingredients separate to keep things from getting soggy. Mix when there are 30 minutes or less. Then, drizzle with poppyseed dressing and serve. The great thing about this salad is that it looks and tastes so complex, but it really is so simple. 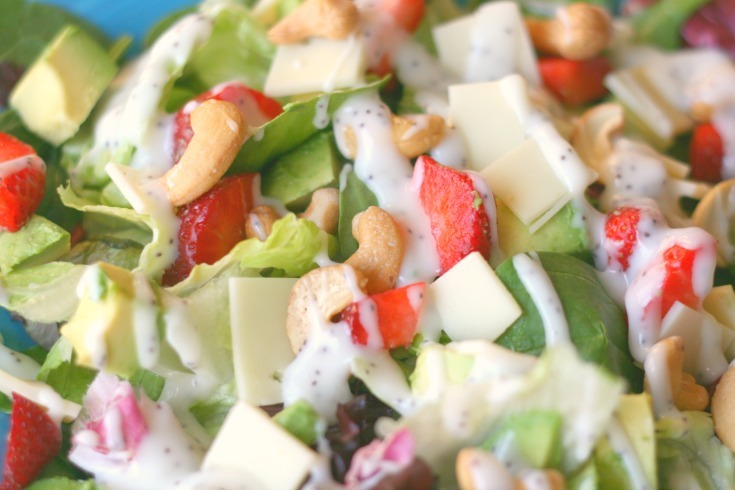 The mixture of vegetables and fruit, the saltiness of the cashews, the tartness of the cheese, and the tang of the poppyseed dressing is truly spectacular. We have eaten this salad for a brunch, lunch, or simple dinner on a warm, summer night. Looking for more salad recipes? Check these out!